Χάρη στην ποιοτική διαμονή και την άριστη εξυπηρέτηση του Pathi Hotel, στην επίσκεψή σας σε Τουνγκόο θα νιώσετε σαν στο σπίτι σας. Από εδώ, οι επισκέπτες μπορούν να έχουν άμεση πρόσβαση σε όλα όσα η πόλη έχει να προσφέρει. Με την βολική του τοποθεσία, το ξενοδοχείο προσφέρει εύκολη πρόσβαση στους προορισμούς της πόλης που πρέπει οπωσδήποτε να δείτε. Με τις υψηλού επιπέδου υπηρεσίες και την μεγάλη ποικιλία ανέσεων, το Pathi Hotel δεσμεύεται ότι η διαμονή σας θα είναι όσο πιο άνετη γίνεται. Για την άνεση και την διευκόλυνση των πελατών, το ξενοδοχείο προσφέρει δωρεάν WiFi σε όλα τα δωμάτια, 24ωρη φύλαξη, ημερήσιος καθαρισμός, υπηρεσία ταξί, υπηρεσία εισιτηρίου. Οι πελάτες μπορούν να επιλέξουν από 24 δωμάτια καθώς όλα διαθέτουν μια ατμόσφαιρα απόλυτης αρμονίας και γαλήνης. Εξάλλου, το ξενοδοχείο διοργανώνει πολλά ψυχαγωγικά δρώμενα έτσι ώστε να έχετε πολλά πράγματα να κάνετε κατά τη διαμονή σας. Το Pathi Hotel είναι μια έξυπνη επιλογή για τους ταξιδιώτες στη Τουνγκόο προσφέροντας κάθε φορά μια ήρεμη και ήσυχη διαμονή. English speaking host was always around to ensure that we're well taken care of. Hotel is very new & clean. Breakfast was good. Room is comfortable & everything works. Onsite hotel restaurant, Harmony, serves good tasty food at reasonable prices. Service was fast. Doesn't seem to have much happening around the hotel. But we used it as a transit stop between Golden Rock & Inle Lake. So it's great for that purpose. The only thing to note is that there's no lift in the hotel & breakfast room is located on the top most floor. Perhaps alternative arrangements can be made for guests not able to walk up for breakfast. Deserves more than the 2star given. An excellent choice for an overnight stay in every respect. 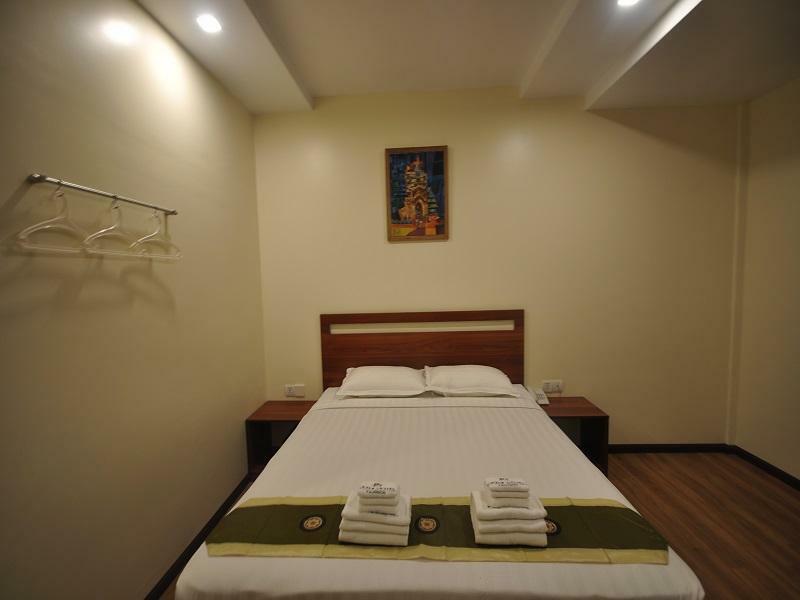 Friendly staff, huge well appointed room with excellent facilities. And very affordable. While internet wasn’t working in the evening it was very fast next day. Remind staff that switching off and on can potentially fix it! Yes, Pathi a good choice. The only downside of this hotel was only their location. It was a literary outskirt which sidecar had to ride us through dusty roads and when we arrived to a cozy hotel our facial was covered with dust. Nonetheless the hotel itself was Awesome. Since we booked through Agoda.com, when we checked in. They upgraded our room from Standard twin bed room to the deluxe family room with 2 doubled beds. Thus room was spacious. Adequate light for work and also night light under bed. New linen and mattress were good for saving our back. Very thoughtful indeed. Plenty toiletries. They use Panasonic Air con so it was quiet and stable air. Breakfast came in set. We also went to their restaurant for lunch and dinner. Food was delicious and not oily. The manager was so kind and hospitable we felt like we were in grandma's house. The facilities were excellent. This just a stop on the way south for us, but we were surprised by the beautiful little town we found ourselves in. Another hidden gem in Myanmar. Amazing hotel for the small price. It is family run and everyone is so friendly. The restaurant serves nice food too. Highly recommended! Good hotel with a very helpful staff. What a great little find the staff were pleasant, location is no different than any of the other hotels I looked at, Tangoo has not got a travel hub of hotels . transport is so cheap it''s location is irrelevant. Staff booked and transported us FOC to bus stop. I really enjoyed Tangoo and the hotel was part of the experience. thank you staff for your wonderful service. Some staff can speak english, you will have some one to help for sure. Location is near to the temple but the only bad thing is the road is very super poor. Even the road from Yangoon is very poor. This is probably the best hotel I have stayed in, here in Myanmar! Their service was also the best I have ever had in Myanmar! The staff and manager were great! The manager helped us with booking our day trip and getting a return bus fare to Yangon! They offer free pickup and delivery to the bus! You can rent motorcycles for a day (10,000)or half a day (5,000). It is close to a lake with beautiful landscaping! The breakfast tastes wonderful! The pillows are a little thick, so you may want to bring your own pillow. However, the room was very clean! Nice hot showers! Very cold A/C! And the room had a very nice bed as well! The wifi was a little slow though. Great price too! This is my second review for this hotel, just after my second stay. Nothing has changed, it is still the best option in the area. Spotlessly clean, great service, friendly staff, fresh sheets and towels, amazing breakfast on a balcony overlooking the moat, and a cheap and delicious restaurant downstairs. Don't miss this place. One of the best hotels we have stayed in Myanmar! Room is super clean & modern. Staff are very helpful and 2 out of 3 staffs at the front desk speak English very well. Location is a little bit outside but it's an easy 5 minute bike ride to the center. One big plus point: we got complimentary snacks several times during our stay! This was our favorite stay ever. Spotless room, hot water, aircon, delicious breakfast, and local snacks on the rooftop at sunset. Staff was incredible welcoming, friendly, and helpful. Restaurant next door was delicious and convenient as we didn't want to leave the hotel we loved it so much. They let us check out late because we had a night bus which was so so kind of them. Considering stopping back in taungoo just to return here!!! What a gem! For the money this is definitely the best hotel we have come across in 6 months of traveling SE Asia. Price was cheaper online ($23 usd) than in person, but still great either way. The building is new. 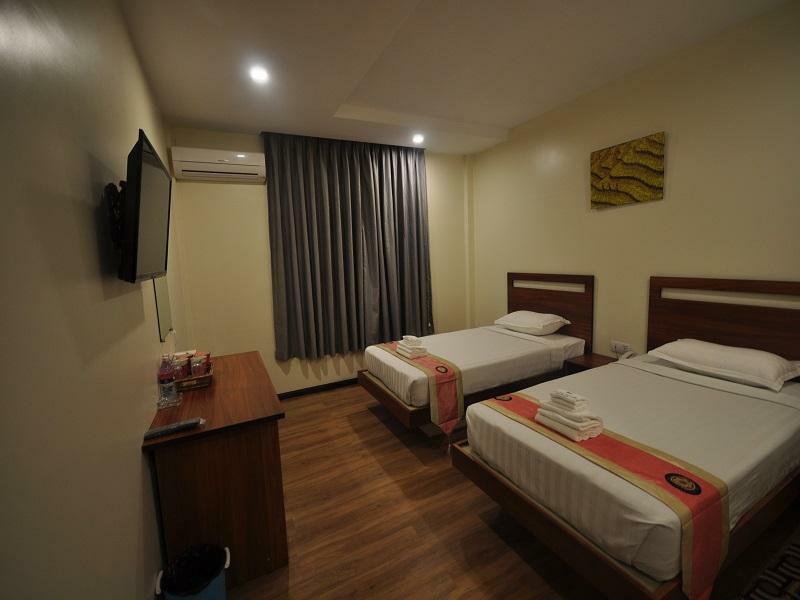 Rooms are clean, spacious, and well planned. There are plenty of outlets accepting US devices and a desk for working. The wall-mounted tv has a handful of English movie channels and the bed is especially comfortable. WiFi works well and the curtains keep the room especially dark when sleeping in. You'll want to get up for breakfast though. It's different each day and always delicious. Juice, coffe, fruits, a main course and 2-3 side dishes. 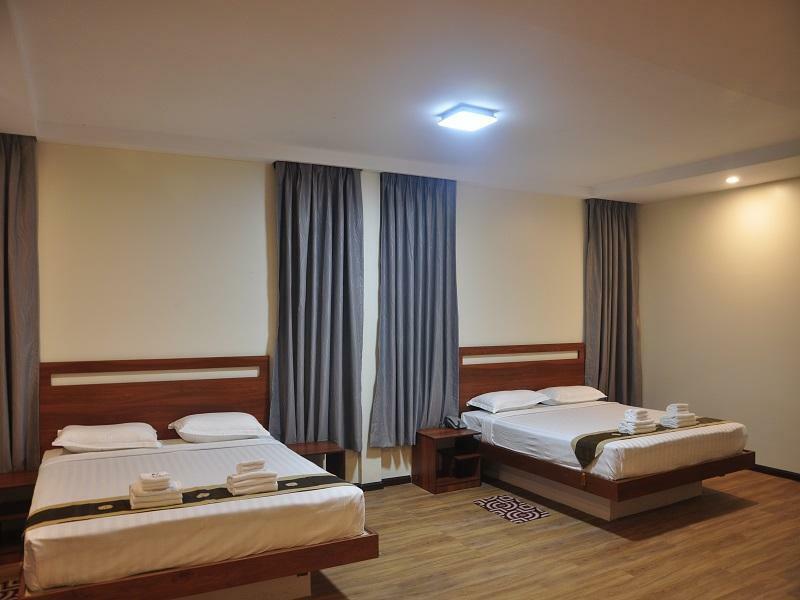 Like most Taungoo hotels accepting foreigners it is situated outside of town. This keeps it peacefully quiet, and if you're wishing to explore there are bicycles and motorbikes for rent at fair prices (5k - 10k). The hotel has a full kitchen restaurant next door which is cheap and every meal we tried was pretty great . Maybe the best part was the service and hospitality. The owner and front desk staff spoke good English and helped immensely with onward travel to Lokiaw. She even called some hotels and reserved our next night.. Our laundry was well done / folded, and hot water was sent to our room multiple times for tea. Stayed for 5 nights while working in the area. This hotel was a pleasure to come back to every night. Some of the highlights: Clean Rooms. The entire hotel was kept incredibly clean. Even the oft overlooked areas in the restroom were cleaned each day. The sheets and blankets were spotless. Good Rooms. The rooms were large enough and well appointed with furniture. Lighting especially was well thought out. Breakfast. You don't get a choice for breakfast, which is a Myanmar dish and which changes every day. But it is excellent. There is a balcony on the third floor overlooking the old city, and the breakfast is hot and fresh. It is also served with plates of fresh fruit, fruit juice, coffee, and pastries. Service. The manager speaks excellent English, and continually checked to make sure our stay was enjoyable. Restaurant. There is a restaurant downstairs, and while there are only local choices on the menu, the prices are super cheap and everything comes out of the kitchen hot and fresh. In conclusion, I can't recommend this hotel enough, especially for the price. The best hotel I have stayed in the Toungoo & Bago region. The price for what you get is really amazing. Both local and foreigner prices are great.